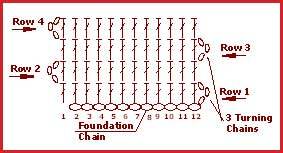 Work a length of chain (foundation chain). For instance, 13 chains. (You do not count the loop on the hook). The number of chains should be equal the number of stitches required plus one stitch. 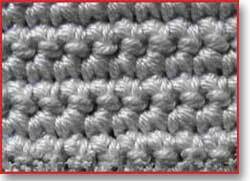 Your 13 chains will make 12 stitches wide crochet fabric. Row 1. Skip the first chain stitch. The single crochet (sc) is placed in the 2nd chain from your hook. Continue working 1 single crochet (1 sc) into each chain stitch. At the end of the row you will have 12 single crochets (sc). Row 2. To begin a second row you will need to make 1 turning chain. Turn your work (the reverse side is facing). Continue working 1 single crochet (1 sc) into each stitch of the previous row.Count your stitches! It is easy to miss one. At the end of the row you will have to have 12 of them. Row 3. 1 turning chain. Repeat row 2. Continue your work till you have a desired length of fabric. The same crocheting instructions can be presented as a chart. If you are a visual person (like the majority of people), you might like it better. Every stitch in a chart has it's own symbol. 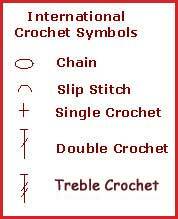 Here are a few International Crochet Symbols. We will start from the most often used ones. I will introduce you to the new symbols every time when it is necessary. With a little practice, you will be able to see the entire patterns at a glance and know exactly where you are in your pattern. Here is our crocheting instructions in symbols. There are few simple rules to follow while reading a crocheting instructions in symbols. Let's practice. Begin to read pattern from the bottom of the chart and move upward while crocheting in rows. See the chart. A project begins with a foundation chain. For the single crochet one extra chain has to be added to the foundation chain to form the height of the stitch. For example, if you want to end up with 12 single crochet stitches, you need to start with a foundation chain of 13. You work "back and forth" (see direction of arrows for each row on the chart) and turn at the end of the row to get you up to the next one. At the end of the row you always make 1 turning chain (ch 1) to keep the edges of your work even. 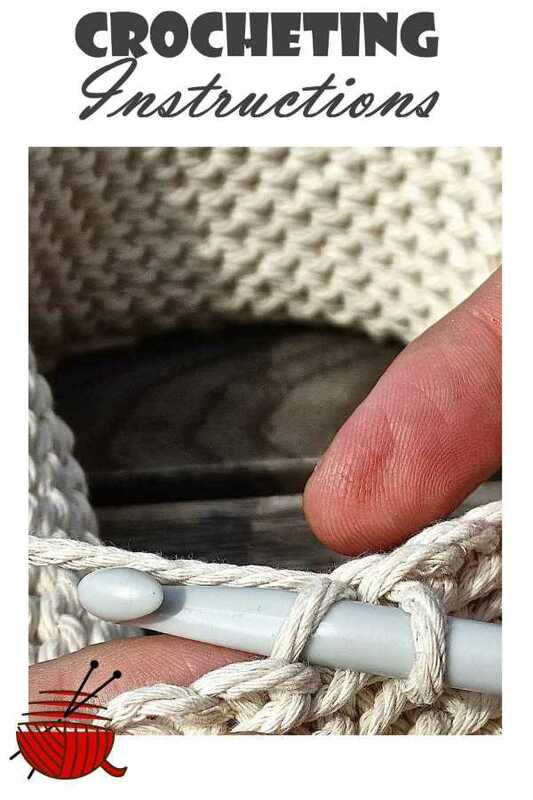 You usually begin the next row in the first stitch after your turn. A double crochet is "taller" than a single crochet. Hence, the number of chains of the foundation chain has to be equal the number of stitches required plus three. Your 15 chains will make 12 stitches. First stitch of the first row make into the fourth chain from the hook. At the end of each row make 3 turning chains. If you find there is a hole at the start of the rows, chain 2 instead of 3 to get the needed height. That's it! Just follow the chart. Now it is turn for our next crocheting instructions. We will learn how to crochet in rounds.